In his first action since a knee injury last season, Anthony Brown throws for 279 yards and four touchdowns. 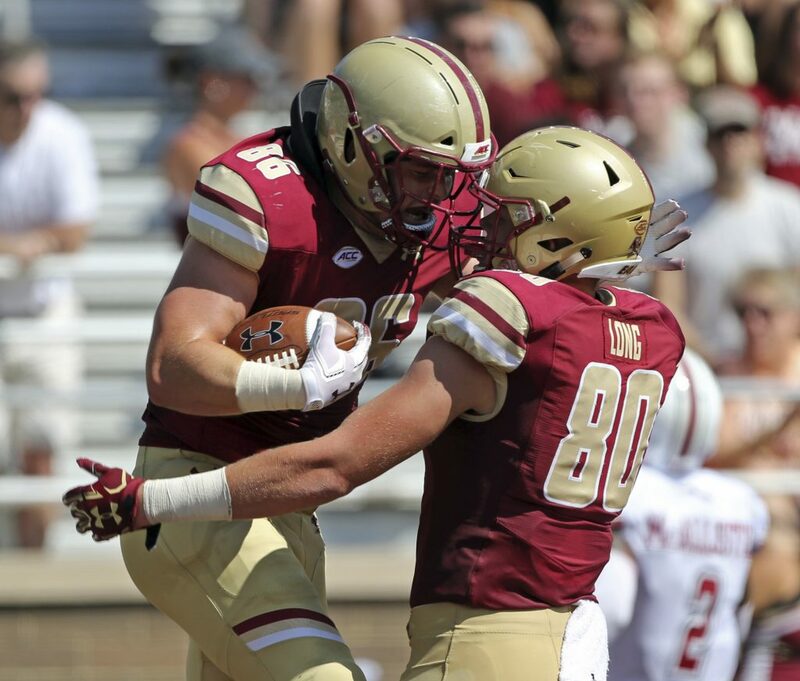 BOSTON — Anthony Brown threw for 279 yards and four touchdowns while playing just the opening half in his return from a season-ending knee injury, and Boston College opened its 120th season with a 55-21 victory over in-state rival Massachusetts on Saturday. Brown, a redshirt sophomore, completed 15 of 21 passes and led the Eagles on TD drives in seven of their nine first-half possessions before sitting out the second half. He missed the final two regular-season games and the bowl game last year after a non-contact, right knee injury that required surgery. NORTH CAROLINA STATE 24, JAMES MADISON 13: Jakobi Meyers had career highs of 14 catches and 161 yards – including two big third-down grabs on the clinching late drive – to help the Wolfpack beat the Dukes in Raleigh, North Carolina. Reggie Gallaspy II added a 6-yard touchdown run with 65 seconds left to seal this one for the Wolfpack. But that came only after Meyers got wide open on the left side for a 39-yard catch on third-and-long earlier in the drive, then followed with a tough 10-yard catch to move the sticks despite getting sandwiched by two defenders. VILLANOVA 19, TEMPLE 17: Zach Bednarczyk threw three touchdown passes and Jeff Steeb and Elijah Trent had interceptions on the Owls’ last two possessions to lead the Wildcats to an upset in the season-opening crosstown matchup in Philadelphia. Bednarczyk connected with Jarrett McClenton for a 30-yard touchdown on fourth-and-9 midway through the fourth quarter to put the Wildcats on top. AIR FORCE 38, STONY BROOK 0: Linebacker Kyle Johnson returned an interception 32 yards for a score as a stingy Falcons defense limited the Stony Brook offense to 75 total yards in a win at Air Force Academy, Colorado. PITTSBURGH 33, ALBANY 7: Kenny Pickett threw for two touchdowns and ran for another and the Panthers breezed past the Great Danes in Pittsburgh.